It works! 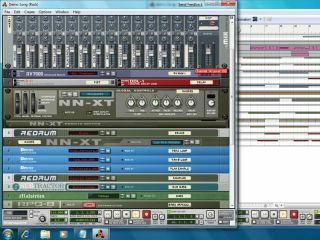 Propellerhead's Reason running in the Windows 7 Beta. With Windows 7 now in Beta, PC users are eagerly counting down to the release of what they hope will be the launch of the best version of Microsoft's operating system yet. This should be available at some point between June 2009 and July 2010. However, there is also some anxiety, particularly among music makers. The launch of Windows Vista was fraught with problems, and it took a while for many of these to be ironed out. In fact, many musicians have taken the decision to stick with Windows XP rather than upgrade. This being the case, we decided to speak to three key music software developers - Propellerhead Software, Steinberg and Cakewalk - to find out how they currently view Windows 7. Happily, we came away feeling reassured rather than frightened. Reason product manager Mats Karlöf explains why the Vista upgrade caused so many problems, and has good news about Reason's compatibility with Windows 7. "When Vista was launched, a new installation procedure was introduced - in general, it became more difficult to install an application. This caused problems for both us and users of Windows Vista Beta, as our installer couldn't give itself the necessary privileges. "As a solution, we released a separate installer for our two supporting technologies - REX and ReWire - to make Reason 3 work in Vista. Today the problems are solved and anyone installing Reason 4 on Vista will have no problems. "So far, things are looking far better with Windows 7, most probably as this seems to be an update to Vista and not a completely new OS from Microsoft. We're currently testing the Windows 7 Beta with our applications, and from what we've seen, we're optimistic that Reason 4.0.1 and ReCycle 2.1 will work straight out of the box, without the need for us to update. "If any compatibility issues are discovered in regards to the final version of Windows 7 then we'll solve these problems as soon as possible." Steinberg's PR manager Angus Baigent tells us why the company aren't worried about compatibility issues with Windows 7. "The first Windows 7 Beta came out in January, so there's still a way to go for Microsoft before they come up with a finalised version. Currently, it's too early to do any serious testing with Cubase on Beta versions of the Windows 7 OS, because any changes that may be done during this phase can have serious consequences for any software running on it - especially for real-time audio software. "We will, however, be working with Microsoft continually in the run-up to the release of Windows 7. We expect to have full support within a time frame that will balance out the interests of Steinberg in offering best possible performance and stability, and the early adopters who want to move to Windows 7 quickly. At this point, though, all indications suggest that Steinberg software should run without problems - pending full testing and official support, of course." Cakewalk CTO Noel Borthwick talks about lower latency and better stability in the newest version of Windows. "Initial reports on Windows 7 are looking promising, although we haven't done any exhaustive internal testing yet. As far as compatibility goes, Sonar 8 is fully compliant with Windows 7 straight out of the box. In fact, due to the bug fixes and optimisations with the audio system in Windows 7, some of our users are seeing improved, lower-latency audio performance and stability with the same hardware, especially under the Windows 7 Beta 64-bit Edition. "We reported several of the issues we found in Vista directly to Microsoft - we know a few have been addressed in Windows 7, but we're hoping that more work is done to ensure better multimedia performance before the new OS finally ships." For a full preview of Windows 7, check out the April issue of Computer Music (CM137), on sale now.